First, whenever feasible, we will try those who have violated American criminal laws in federal courts….The second category of cases involves detainees who violate the laws of war and are therefore best tried through military commissions…. The third category of detainees includes those who have been ordered released by the courts….The fourth category of cases involves detainees who we have determined can be transferred safely to another country. 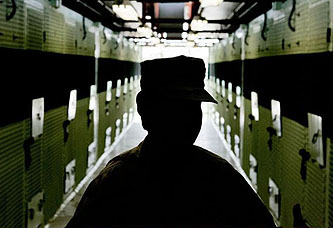 ….Now, finally, there remains the question of detainees at Guantanamo who cannot be prosecuted yet who pose a clear danger to the American people….Examples of that threat include people who’ve received extensive explosives training at al Qaeda training camps, or commanded Taliban troops in battle, or expressed their allegiance to Osama bin Laden, or otherwise made it clear that they want to kill Americans. These are people who, in effect, remain at war with the United States. If we don’t have enough evidence to charge someone with a crime, we don’t have enough evidence to hold them. Period. The power to detain people without filing criminal charges against them is a dictatorial power. It is inherently arbitrary. What is it that they are supposed to have done? If it is not a crime, why on earth not make it one? If it is a crime, and we have evidence that this person committed it, but that evidence was extracted under torture, then perhaps we need to remind ourselves of the fact that torture is unreliable. If we just don’t have enough evidence, that’s a problem, but it’s also a problem with detaining them in the first place. I appreciate the outrage, but this is a genuinely knotty problem. It was knotty under Bush and it remains knotty under Obama. For various reasons, some defensible and some not, Obama is right: there are almost certainly a small number of Guantanamo detainees who are (a) unquestionably terrorists and unquestionably still dedicated to fighting the United States, but (b) impossible to convict in any kind of normal proceeding. At the same time, they aren’t American citizens. They were captured on a foreign battlefield, not U.S. soil. They are, essentially if not legally, prisoners of war in a war with no end. So what do we do? There is no president of the United States who has ever lived who would release such people. There’s no president who would survive doing so even if he did. It’s an impossible situation. So what do we do? This is a case where, unfortunately, I think outrage is too cheap and too easy. We’re still left with the question: what do we do? UPDATE: Glenn Greenwald makes the argument against Obama’s proposal here. Big Tent Democrat responds here.